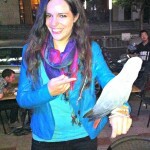 Day 135 in Beijing: Bang! Bang! and the Bird Lady. Jill, our new friend Federica, and I were at a wine tasting a few days ago. After tasting some great wines from different areas of the world, we headed out to a restaurant that was close by and we’d tried once before. It is called Bang! Bang! and it is fantastic. They have a large menu and everything we’ve tried so far has been delicious. We especially liked the hummus with garlic in it and the bleu cheese pizza. My mouth is watering thinking about it now. 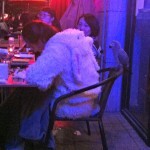 Anyway, as were sitting there, we noticed a rather interesting bird on the chair behind a woman eating her dinner. It was an African Grey. They are rather famous in the bird world because they can have a mental and emotional capability of a five year old child. Some have incredible vocabularies and are very expressive. Then we noticed the woman. I’m not sure who was more interesting. 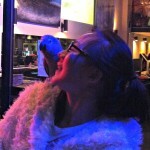 The Bird Lady and her African Grey. Yes, that is a bunny outfit she is wearing. 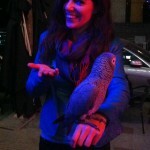 Federica and the African Grey. Federica doing her best not to be terrified. The African Grey just gave the Bird Lady a kiss.